We have always enjoyed the comfort of our animals while we garden, but yes, sometimes they can get into trouble. If "Fluffy" is, shall we say, fertilizing your newly created flower bed, cat repellent works well or simply laying a piece of chicken wire over the newly planted bulbs will be enough until the soil has settled. "Fido" is another matter. Dogs are pack animals, if they see you burying bulbs in the ground, they are more than happy to "help you find it again" - its a game! If you are having trouble with your dog digging up your newly planted bulbs, simply put him or her into the garage or house where there is no sight line into the garden while you plant. Do not use any blood meal or other interesting smelling additives to the soil, which will also help to control raccoons from digging in your garden. 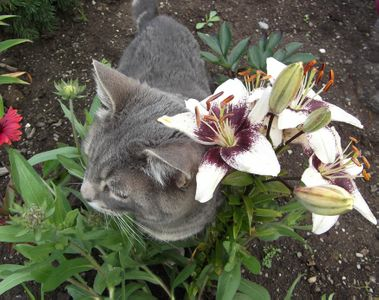 Dog chases cat, cat runs through newly emerging lily sprouts, dog follows and steps on the tender shoots and they are broken - will they come back? Lily bulbs make one shoot per year (a true bulb) and because not too much of the bulb had been used up making a stem, it should come up again the next year. So, don't dig them up and discard the bulbs - put up a barrier until the stems are up high enough so the animals go around.